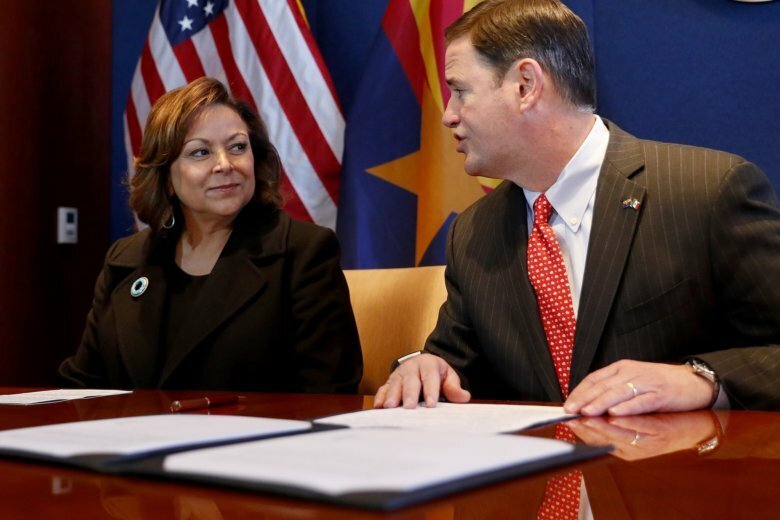 PHOENIX (AP) — The governors of Arizona, New Mexico and Mexico’s Sonora state signed an agreement Wednesday to study a plan to export natural gas to Asia by connecting existing pipelines to move the fuel south to the Gulf of California. The non-binding agreement calls for the states to collaborate on promoting investment, research and innovation to eventually export natural gas from New Mexico’s abundant supply to Asian nations, which are leading importers of liquefied gas. The memorandum, signed by Republican Govs. Doug Ducey of Arizona and Susana Martinez of New Mexico and Claudia Pavlovich of Sonora, does not call for the commitment of any funds. “Asia’s burgeoning demand, New Mexico’s abundant supply, and Arizona and Sonora’s strategic location and transport networks all combine to present an opportunity for continued regional growth,” the agreement states. New Mexico is a top producer of natural gas, and Martinez, who leaves office at the end of the month, has made finding ways to export the fuel a priority. “Opening new markets in Asia would not only create jobs in the regions of our state that produce natural gas, it would benefit all New Mexicans,” said Kyler Nerison, executive director of the pro-energy New Mexicans for Economic Prosperity. He said increasing energy exports could help generate tax revenues needed to pay for the state’s schools and infrastructure. The pact notes that Arizona has been fast-growing in terms of population and employment, suggesting that running the fuel through the state’s pipelines and facilities could bring economic benefits here as well. The plan proposes that the three states study ways to connect existing pipeline networks in Arizona and Sonora to move the fuel from New Mexico to the U.S.-Mexico border, then south into Sonora state and west to the port of Guaymas on the Gulf of California, where tankers would pick up the fuel for the trip to Asia. Guaymas is far closer to Asia than Houston on the Gulf of Mexico, where most fuel leaves the U.S. for Asia. Shipping the natural gas from Guaymas would save the time and money it costs to take shipments through the Panama Canal.